Burberry has cemented its reputation for innovation by partnering with Line, a Japanese messaging app with huge presence in Asia. The partnership will see Burberry livestreaming its Autumn/Winter 2015 show at London Fashion Week next week. Much of Line's appeal lies in its emoji-style stickers, which follow in the tradition of cutesy Japanese art. The stickers include Line's own mascots, Brown the bear and Cony the rabbit, as well as established characters such as Hello Kitty. The app has 170 million monthly active users, mostly across Japan, Thailand and Indonesia. 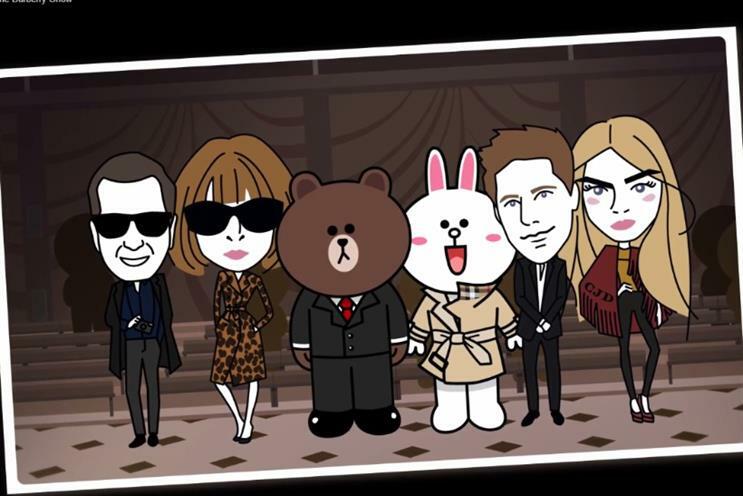 The partnership with Burberry sees the arrival of new animated stickers, with cartoon versions of brand ambassador Cara Delevingne, Christopher Bailey, Mario Testino and Anna Wintour. In a short film promoting the partnership, a giggling Cony and a put-upon Brown visit London, touring the city while sporting various trademark Burberry items. They then join the cartoon Wintour and Testino at the Burberry Autumn/Winter show at London Fashion Week.